One night in May, 1858, Franklin Sanborn called for a meeting at the American House Hotel in Boston. John Brown was in town; it was time to go over the plan. Much had changed in the year since Sanborn first met Brown. At that time the 26-year-old Harvard grad had been acting as secretary for the Massachusetts State Kansas Committee. It was in his austere office that Brown arrived one day, searching for money and guns to help continue his free-state battles in Kansas. Brown had regaled Sanborn with stories of his larger-than-life adventures on the frontier. Sanborn was so impressed that, by the end of their meeting, he agreed to get Brown whatever he needed. Through Sanborn, Brown had been introduced to the elite of Boston. He was not unknown; stories of his adventures in Kansas had been widely published in the New England press. Brown’s appearance at a dinner party — with his disheveled hair and old corduroy suit -- stirred excitement. Fellow abolitionists were able to meet a true freedom fighter, fresh from the front lines. To them, Brown seemed like a fantastic frontier hero, straight out of a romantic novel. Thomas Wentworth Higginson — a minister and amateur boxer, Higginson was from one of the oldest families in New England. He had little tolerance for hesitation or weakness. Gerrit Smith — a nervous, eccentric, and very wealthy man, he was already Brown’s benefactor, having given him land on which to live in the Adirondacks. Reverend Theodore Parker — an eloquent and controversial Unitarian minister. Dr. Samuel Gridley Howe — a highly respected pioneer of educational reforms for the blind, insane and feeble-minded. George Luther Stearns — one of the chief financiers of Emigrant Aid Company, which facilitated the settlement of Kansas by anti-slavery homesteaders. Initially, Brown focused his activities on Kansas, but now he had a more ambitious plan; he wanted to invade Virginia and incite a slave insurrection. Sanborn felt that Brown's plan was doomed to failure. He argued against it, but Brown was determined to see it through. Sanborn would later reflect: "[It was] an amazing proposition, desperate in its character, seemingly inadequate in its provision of means, and of very uncertain results.... But no argument could prevail against his settled purpose, with many or with few, — and he left us only the alternatives of betrayal, desertion, or support. We chose the last." Whether the members of the group were initially against it or not, they soon were excited by the prospect of action. They set about raising money for Brown. Fundraising was the chief function of the "Secret Six." Brown needed money to supply his men, buy guns and "pikes" (spear-like weapons), which were to be given to the newly liberated slaves. They called on friends and family, and dug deep into their own pockets, but an economic downturn had all but dried up donations. Then Sanborn received a letter from a man who had served with Brown in Kansas. He claimed the Massachusetts State Kansas Committee owed him money for his work with Brown, and that if he didn’t get paid, he would expose the plot to attack Harpers Ferry and he knew the men behind it. Gerrit Smith called a meeting. He wanted to cut off all connections with Brown. "I never was convinced of the wisdom of this scheme.… It seems to me it would be madness to attempt to execute it." Others in the group tried to console Smith, suggesting that they only postpone the raid. Higginson was vehemently opposed to a delay. Smith was, in Higginson’s opinion, a coward, and too nervous for the work at hand. "I regard any postponement as simply abandoning the project." But the group voted to delay the raid. They went on to formulate a new "blind" arrangement with Brown, in which he would not provide the members any future information of his plans; if criminal charges were ever filed, they would have the protection of plausible deniability. Another crisis occurred when, five months before the raid, journalist James Redpath published a book calling for free-state allies to instigate a black insurrection. Redpath knew Brown — had ridden with him in Kansas -- and had been told of the raid. To the alarm of the group, he dedicated the book to John Brown. "You, Old Hero!" wrote Redpath, "believe that the slave should be aided and urged to insurrection and hence do I lay this tribute at your feet." Month after month, delays pushed the raid back, and pressure within the group continued to build. 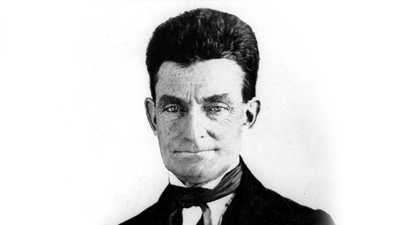 Then, on October 16, 1859, John Brown made his attack. Brown’s supporters must have been saddened - but not surprised - by Brown’s failure; happy that he was alive, and happier yet that he was refusing to name his backers. But documents were found in Brown’s hideout, letters of correspondence between Brown and the men. Suddenly, the identities of the Secret Six wasn’t so secret. In the following weeks, the group waited for the fallout. At any moment they expected to be hauled off to Virginia to stand trial. They sent high-dollar lawyers to represent Brown in court, hatched plots to break him out of jail, but the real question was whether to stay or run. Gerrit Smith suffered a breakdown. He was led off to an asylum, "waving his arms and calling out that he was going to Virginia to suffer with John Brown." Howe and Sterns took off for Canada and remained there until after the execution. Sanborn twice fled to Canada, fearing his arrest was imminent. On April 3, 1860, federal marshals did attempt to capture Sanborn, but the townspeople of Concord turned out to protect him. Higginson didn’t run. He considered a last minute plan to save Brown by kidnapping Governor Wise of Virginia, but it was never attempted. He would always feel responsible for Brown’s demise. "I...should have realized the need to protect John Brown from himself." Reverend Theodore Parker was in Rome, dying from tuberculosis. He hailed Brown as an American saint and, on news of his death, said; "The road to heaven is as short from the gallows as from the throne."